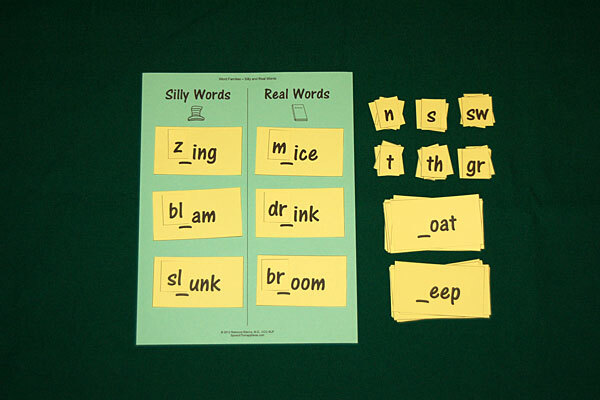 These simple activities can be used with younger students for basic skills such as color or number matching or with older students as a reinforcement for their speech and language practice. Draw mitten shapes on the papers and cut them out. If you are going to work on number matching, write numbers on the mittens. Color matching – Lay out one mitten of each color in front of the student and give him/her the pom poms. Have the student place pom poms on the mittens of the same color. Number matching – Put the mittens in front of the student and give him/her some pom poms. Have the student read the numbers on the mittens and place the correct number of pom poms on each mitten. Pom pom collecting – Give each student a mitten. The students earn a pom pom to place on their mitten after the completion of a speech or language task. Pom pom toss – Have the students earn a pom pom for each speech or language task. After the students have about 5-10 pom poms, have them take turns standing behind a line and tossing their pom poms onto mittens that match the pom pom’s color. For points…you can give one point if the pom pom lands on any mitten and two or three points if it lands on a mitten of the same color.